Mainway’s material handling systems and conveyor solutions are custom designed for automotive applications, which require specialized equipment for individual processes. Be it handling tires, transmissions, fascias or front end modules, each have their own logistics peculiarities. We design reliable automation solutions for sequencing of components and precise material handling systems to deliver maximum uptime and greater productivity. 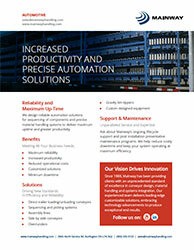 Our material handling solutions meet your throughput requirements – guaranteed. Mainway’s ongoing lifecycle support and post installation preventative maintenance programs keep your system operating at maximum efficiency.